Villa Viento, located east of Prospect Plantation in Ocho Rios, is a spacious, ocean front, 7 bedroom, 7 bath villa nestled in a large, 2 acre, lush tropical garden overlooking the sea. This villa is composed of a Main House with two bedrooms, the Island suites with three bedrooms, and the Seaview suites with two bedrooms. Villa Viento's grounds are extensive and perfect for large wedding groups. The grounds can accommodate up to 150 people for weddings or special events (User fees apply, see Features). Villa Viento can be rented as a four bedroom to seven bedroom villa. All guests would dine at the main house. At no time would the villa be rented to additional groups, so if you rent four or more bedrooms you have the entire villa estate to yourself. A large outdoor bar (with electricity, sink and refrigerator) can seat up to twenty people and additional tables can be set up for special events. Villa Viento Main House has 2 air conditioned bedrooms with en-suite bathrooms that can be configured with king or twin beds. Villa Viento's Main House also consists of a comfortable living room opening onto a large (30x12, 16x14 L shape) outdoor, covered veranda with Jamaican wicker seating, lounge chairs and dining for up to 16 people. The veranda leads to the large fresh water pool and spacious sea side bar seating up to 20 people. From the bar you can watch the sun go down over the sea and coastal mountains. The Island Suites were recently completed and are separated from the main house by a paved path. They composed of three separate bedroom suites, with seating areas, TV's, air conditioning, phone and small refrigerators. These suites all have full size baths and large closets.One suite has two double beds, the second has a queen bed and sofa bed and the third bedroom has a king or two twin beds. Dining is at the main house. The Seaview Suites are also separate from the main house and the two upper Island suites have expansive views out over the green lawn to the sea. These two large suites share a front porch. Each suite has twin or king beds, seating area, TV, large full bath with shower, air conditioning, phone and small refrigerators. Dining for the Seaview Suites is at the main house. Outdoors the villa is surrounded by two acres of lawns and gardens. The villa has a large fresh water pool with lounge chairs for sunning. There is a romantic gazebo located at waters edge that has been used for wedding ceremonies and lazy afternoon naps. Directly next to the gazebo are steps that lead down to the waters edge. Swimming is not recommended at Villa Viento due to currents and rocks. 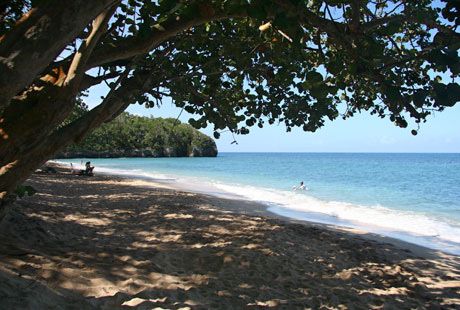 The famous Reggae Beach is located just one quarter mile away for sandy beach swimming. The villa has a full staff composed of cook, housekeepers, laundress and gardener. Two acres of lush lawns, garden and "nature trail"